Borderway Black and White Sale Offers Elite Collection of Dairy Genetics including a line-up of entries from Northumberland. Once again, Harrison & Hetherington will host this year’s Borderway Black and White Sale and as always it offers an elite line up of world class genetics, with over 100 outstanding heifers being presented from across the UK, Ireland and the Netherlands. Consignors from Northumberland include Absolute Genetics, Paragon Pedigree Herd from Hexham. Now in its 31st year, this globally recognised event, being held on Saturday 2 December, has established itself as one of the most important dairy sales in the pedigree calendar, and this year the line up is stronger than ever. Sponsored by Genus ABS and Holstein UK, the sale, which commences at 11am, includes a Soloman granddaughter from the Grand Champion World Dairy Expo 2015 winner, Lovehill Goldwyn Katrysha EX96 2E and an Ultra Stylish Diamondback daughter from the 2017 Agriscot Super Cow, I-Cow Huddlesford Rosann 899 VG88. If you are looking for red genetics, the sale includes a Red Awesome Red daughter from Luck-E Advent Kandie EX95, the Senior Champion and Best Udder World Dairy Expo winner 2014 and Red & White cow of the Year 2014. There is also on offer an Atwood daughter from one of Ireland’s most successful show cows, Priestland 5235 PS James Rose EX95 2E. 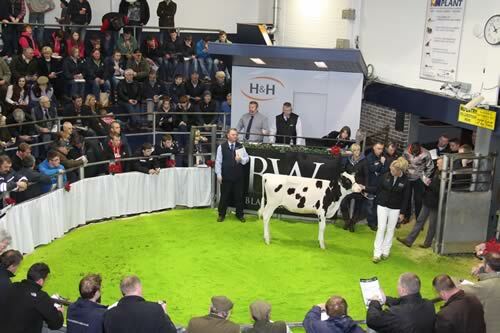 “The longevity and success of this sale is testament to the quality of animals being presented. Consigners have been incredibly supportive of this event over the last three decades and credit has to be paid to them for establishing it as a valued fixture on the annual calendar for pedigree dairy producers. “We have an amazing line up this year, with progeny from the world leading genetics being offered, giving UK producers the rare opportunity to invest in some truly outstanding animals. With the positivity in the dairy sector at the moment, I look forward to seeing some new faces to the ring, acknowledging the value of introducing these legendary genetics to their herds. “The quality of genetics continues to improve as new innovations in breeding techniques become more successful around the world. To achieve the status of the some of the cow families in our catalogue is remarkable and a real reflection of the dedication and professionalism of our consigners.